In the midst of all the crazy activity going on over here getting ready to move in to my shop booth on Saturday, I decided to take a little break yesterday to do some sewing for my boys. It is Celebrate the Boy week after all, and I needed a creative break. 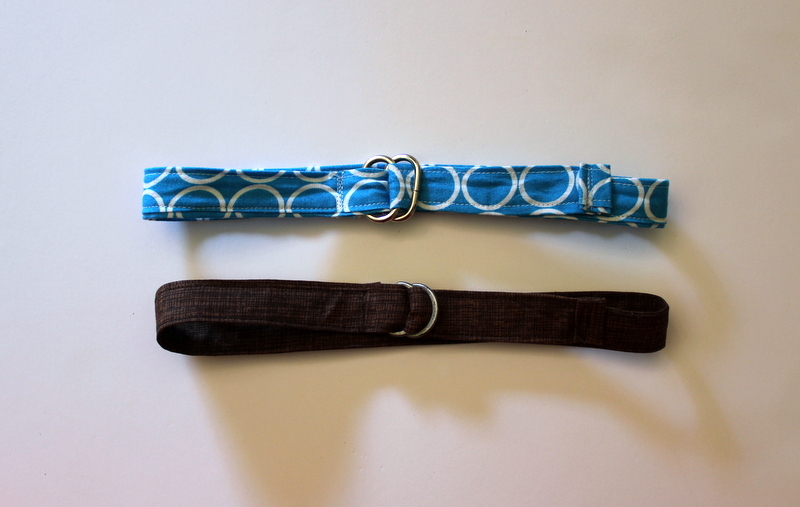 First off, a super quick and easy project- some fabric belts. Oliver has been given quite a few pair of pants and most of them fall right off his skinny little waist- even wearing his cloth diapers! Looks like I have a tall and skinny kid…. just like his daddy. 🙂 I have been meaning to try this pattern for a while and just never got around to it. The belt pattern is the Hold ‘Em Up Belt from Sewing for Boys. I modified it a bit to make the belts 3/4″ wide instead of 1″ since 1″ is too big for his pant loops. I used some old D-rings I had saved from some discarded purses of mine. The blue one is my favorite. I just love the pop of color it gives. Fabric is from a Pink Castle order back when she had her moving sale: (FYI if you need a good online shop, I highly recommend Pink Castle Fabrics!) Metro Circles in Turquoise and Sketch in Coffee. Don’t know why I didn’t make these sooner- they came together so quickly and work really well on his pants. I used some Craft Fuse 808 as interfacing to make them a bit stiffer and they turned out a perfect weight. Next up, we have my first handmades for little brother- some Quick Change Trousers. Pattern is from Anna Maria Horner’s book Handmade Beginnings. I made a few of these for Oliver and really enjoyed the pattern so I decided little bro needed his own pair. Size is 0-3 months. On Oliver, these tended to run big so not sure how soon the pants will fit the little man, but I can’t wait to try them out….Oh only about 14 more weeks till we get to meet this little fella! 🙂 I love the fabrics together on these pants. I used more of my Pink Castle order- the Metro Circles in Gray and some of the Summersville Alphabetty In Seafoam print I’ve been hoarding. Kona cotton blue is the coordinating reverse fabric. I love these metro circles and wish I had bought more! That’s all my extra fun I can have for now- back to shop sewing. Hopefully the move goes well this week and I can tackle some fun boy projects next week. Glad Celebrate the Boy is 2 weeks long! This entry was posted in Kid sewing and tagged anna maria horner, celebrate the boy, fabric belt, quick change trousers, sewing for boys by oliver's fancy. Bookmark the permalink.